Between 1736 and 1940, trade in commodities and securities in Rotterdam took place in this exchange building - designed by architect Adriaen van der Werff - on the Westnieuwland. Securities traders never got their own floor or building in Rotterdam. It were mostly bonds of local funds that were listed on the Rotterdam stock exchange, such as Rotterdamse Lloyd, the province of South Holland, and Stadion Feijenoord (Feijenoord Stadium), most commonly known as De Kuip. In 1936, the construction of a new exchange building on the Coolsingel was started. After the old Beurs van Van der Werff was ravaged during the bombardment of Rotterdam, the new exchange building was put into use early - in May 1940. Over a decade before the Beurs van Hendrick de Keyser was built in Amsterdam – in 1598, to be precise – Rotterdam already had a exchange building on the Haringvliet. Because of a lack of space, trade moved to the Noordblaak in 1635. As of 1736, trade occurred in a exchange building on the Westnieuwland, designed by architect Adriaen van der Werff. 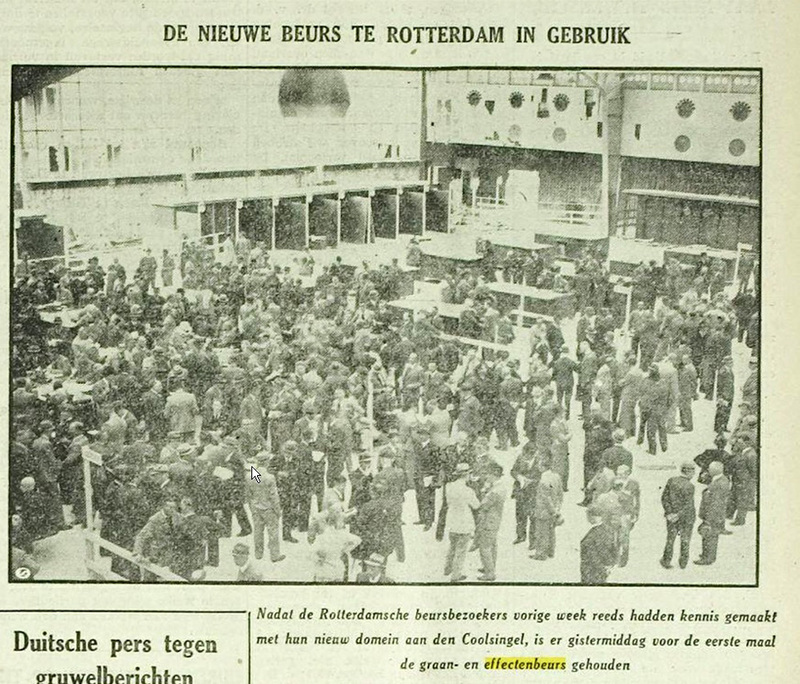 Eventually, trade ended up in 1940 on the current site of the Beurs World Trade Centre on the Coolsingel. In the subsequent exchange buildings, mainly commodity trading was conducted. Securities trading had also occurred since the 17th century, but it was not until 1898 that it was properly organized. This had everything to do with the establishment of the Vereeniging van Effectenhandelaren (Association of Securities Traders) in Rotterdam. From that year onwards, this association was the sole bearer of responsibility for the organization of the Rotterdam securities exchange. Although the Rotterdam securities trading has never had its own building, there was independent pricing, and it had its own rules. The minimal amount of capital that had to be placed for a listing was only a fifth of the amount required in Amsterdam. 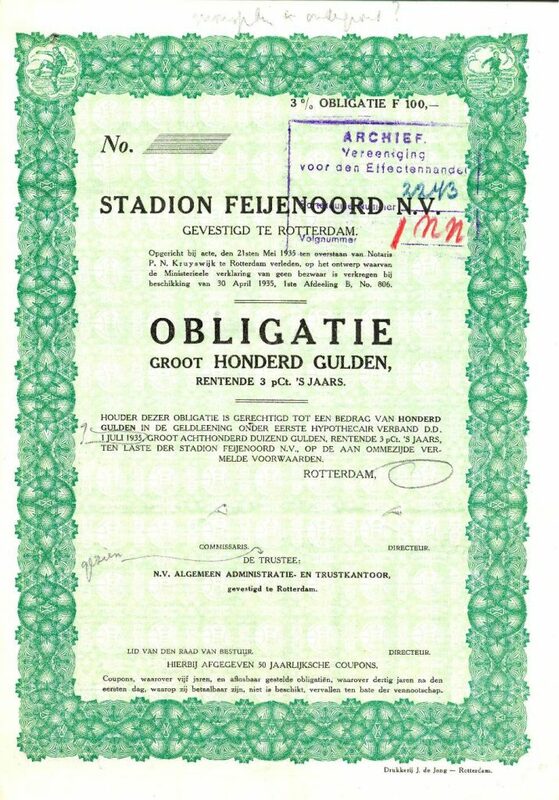 In 1958, approximately 800 funds were listed, including Stadion Feyenoord, Koninklijke Rotterdamse Lloyd, and the province of South Holland. 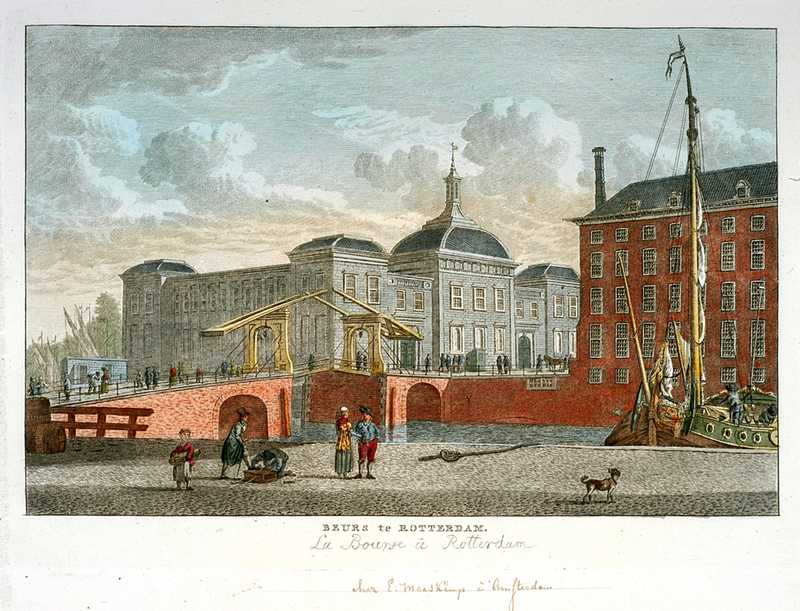 The stock exchange in Rotterdam had many local funds and always kept operating in the shadow of the Amsterdam stock exchange. In 1972, the Vereniging voor de Effectenhandel in Amsterdam changed its statutes. Henceforth, it would operate as a national organization. Non-Amsterdam members could join as well to gain access to the Amsterdam securities exchange. As a result, securities trading concentrated in Amsterdam. The securities exchanges of Rotterdam and The Hague were abolished in 1974.